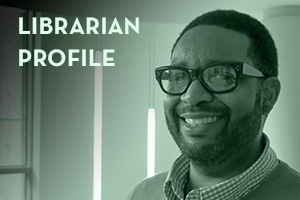 Derrick Jefferson brings a wealth of expertise to his role as Communication Librarian. Always imaginative, he majored in Creative Writing as an undergraduate at San Diego State University and then moved on to the graduate Film program at the Art Center College of Design, before getting a second graduate degree in Library and Information Sciences at the Louisiana State University. In between all of his academic pursuits, Derrick operated in the film industry in Los Angeles, had a stint as a food photographer, and worked as a journalist. Throughout his life, Derrick's parents instilled in him the value of service work, which led to his first library job as a volunteer at a public library in Burbank, CA. Later on, as a graduate student in New Orleans, Derrick worked to restore local libraries post-Katrina. This restoration work encompassed everything from rebuilding collections to cleaning walls and carpets. Derrick's passion for helping others is also evident through his work here at AU. In addition to offering personal appointments throughout the week and providing support at the Research Assistance Desk, Derrick holds SOC office hours every Monday 1–3pm on the Terrace Level of McKinley. Derrick finds that his experience as an embedded librarian has led to more serendipitous encounters with SOC students and faculty. He is also enthusiastic about nurturing nontraditional students, as a result of his experience in an essentially distance MLIS program. Although he was attracted to the role of technology in librarianship, he found that "as a people person, distance education was very difficult. It can easily result in a sense of disconnection." In order to combat the difficulties of distance learning, Derrick works to meet with students from night and weekend programs via Skype, Google chat, email, or by phone. "Outreach is so important," he says. "The 'average' college student is continuing to change and I want to be a part of their experience. Any student who is here at AU has worked hard to get into their program and we [librarians] want to see them succeed and will go above and beyond to help that happen." Derrick loves "helping students and pairing people with resources. I love seeing the wheels turn when you connect someone with the articles that can kick start their research." Derrick was thrilled to join the AU community as the Communication Librarian because it married so many of his interests and felt like an ideal fit for a creative, outgoing person. He also enjoys that libraries offer a continuously evolving environment, citing the new game collection as a perfect example of library innovation with collections; "We are not just books anymore;we are so much more than that. We can help researchers navigate the informational waters and find resources that they didn't even know existed." Although Derrick is fairly new to AU;he has already gotten deeply involved with campus life. Working with the Ann Ferren Conference on Teaching, Research, and Learning Planning Committee has been especially rewarding: "It's great to be brainstorming and networking with people from all across campus." His work on the Online Learning Advisory Committee allows Derrick to contribute to the improvement of the distance education experience for both students and faculty. Within the Library, Derrick serves as a co-chair for the External Diversity and Inclusion Committee, examining the role of the Library in fostering equity and acceptance within the AU community. Beyond the AU community, Derrick has just been accepted into the American Library Association Emerging Leader class of 2015. This is a highly visible and competitive program—this year there were more than 200 applications for a class of 50 people. Derrick brings both organizational and leadership skills to the institution, along with a dedication to service: "Do not be afraid to reach out to us. There are no silly questions, and, if you are wondering about something, there is another person out there with the same question. My door is always open."